Come and learn to sing in harmony with your local barbershop chorus! 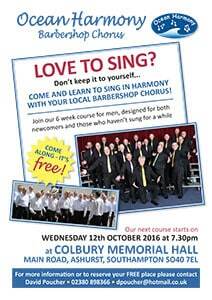 Join our 6 week course for men, designed for both newcomers and those who haven’t sung for a while. Copyright © 2009 - 2019 Ashurst and Colbury Parish Council All rights reserved.